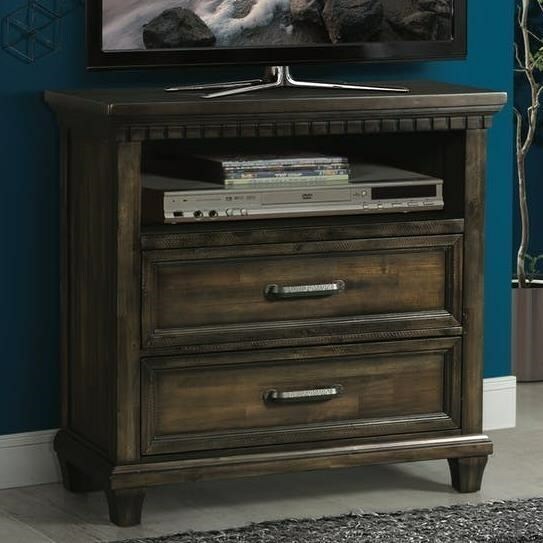 The media chest has both sophisticated traditional design and convenient storage space. An open shelf is perfect for game consoles or other media devices while two drawers provides concealed storage for all the accompanying accessories. Details such as dentil molding, raised drawer panels, and square tapering legs create a charming classic look. The McCabe Traditional Media Chest with Dentil Molding by Elements International at Miskelly Furniture in the Jackson, Pearl, Madison, Ridgeland, Flowood Mississippi area. Product availability may vary. Contact us for the most current availability on this product.